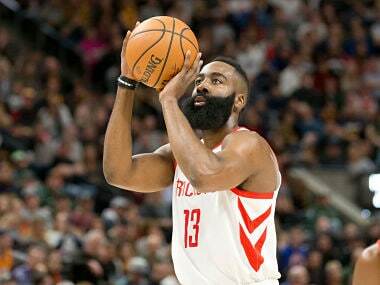 Los Angeles: A 36-point display from James Harden and a towering defensive performance from Trevor Ariza helped Houston edge past Brooklyn 122-118 on Monday to hand the Rockets a seventh straight win. 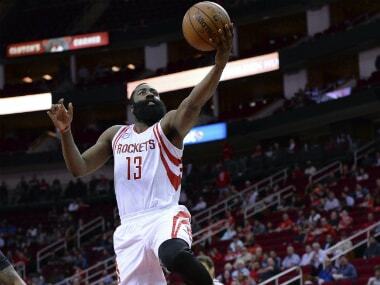 Harden contributed eight rebounds and 11 assists while Eric Gordon added 24 points off the bench as Houston improved to 18-7 at the Toyota Center. But while Harden finished as top-scorer, it was the eye-catching performance of Ariza that helped Houston get over the line. Ariza produced a superb block of a layup attempt from Nets guard Joe Harris shortly before the buzzer to snuff out any chance of Brooklyn forcing overtime. Nets center Brook Lopez scored 26 points for the visitors with Sean Kilpatrick and Isaiah Whitehead contributing 30 points between them. Jeremy Lin added 10 points and seven assists. Harden was relieved the Rockets had survived a furious late assault led by Lopez. "This is the NBA," Harden said. "You've got guys that can get confidence and make shots, and it's tough to put (the fire) out. Lopez started to get it going early, and they threw the ball to him and he was just scoring. But we got stops when we needed to." Nets coach Kenny Atkinson meanwhile drew consolation from the return of Lin, making his first appearance since 2 November. "It helps having Jeremy back," Atkinson said. "It just gives us organization. He's a veteran and he had seven assists in 20 minutes, and I think that was big. "He knows where to give Brook the ball and when to give Brook the ball, and that's from his experience." The Rockets are now level with Western Conference rivals the Los Angeles Clippers, who improved to 18-7 with a pulsating win over the Portland Trail Blazers at the Staples Center. Blake Griffin scored 26 points while Chris Paul added 21 points and 14 assists as the Clippers dug deep to win a nail-biting battle 121-120. 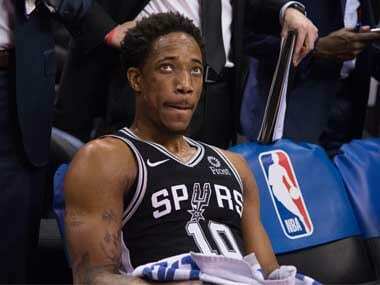 Elsewhere Monday, DeMar DeRozan scored 30 points and gave a flawless display of free throw shooting as the Toronto Raptors downed the Milwaukee Bucks on 122-100. Terrence Ross also weighed in with 25 points after appearing from the bench as the Raptors improved to 17-7 to stay hard on the heels of Eastern Conference leaders Cleveland. DeRozan also went 15-for-15 from the free throw line as Toronto bagged their third consecutive victory and ninth in 10 games while the Bucks slumped to a third straight defeat. Giannis Antetokounmpo topscored for the Bucks with 30 points and eight rebounds but it was not enough to stop the team slipping to 11-12. 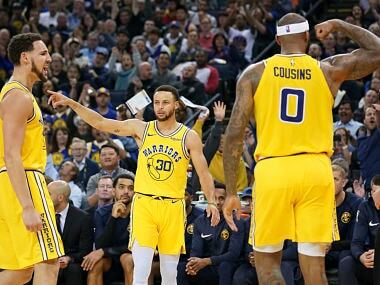 The Raptors were always in control of the contest, building a 26-point lead at one stage in the first half before a Milwaukee fightback saw them move to within eight points in the third. However an 11-point blast from Ross in the fourth quarter pushed the Raptors back out to a 23-point lead with just over five minutes left. Kyle Lowry also chipped in with 18 points for Toronto, while DeMarre Carroll added 13 and Jonas Valanciunas 11. 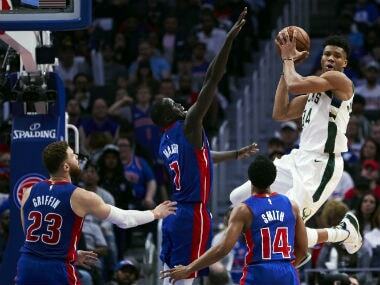 "(The Raptors) were in character the whole night from the start; we weren't," Bucks coach Jason Kidd said. "Our defense was non-existent." In Indianapolis, Paul George and Myles Turner led the Indiana Pacers with 22 points each in a 110-94 win over the Charlotte Hornets. Jeff Teague scored 16 points with 11 assists as the Pacers pulled away in the fourth quarter, outscoring Charlotte 34-21 to seal victory. Marco Belinelli topscored for Charlotte with 14 points on a night to forget for the visitors, who shot only 33 percent from the field as their record fell to 14-11. Indiana improved to 13-12 with the win.